I burned through the insanely brilliant Broken Empire Trilogy in 72 hours. I became delirious with lack of sleep wrought by potent imagery, and keen anticipation of what the sociopathic protagonist, Jorg of Ancrath would do next. When the trilogy was finished I actually threw a temper tantrum, because I didn’t want it to be over. The stories weren’t perfect (The revelation about the setting was too long in coming in Prince of Thorns; the forces battling with Jorg weren’t as clearly delineated as one might have wished in King of Thorns; and I wasn’t thrilled at the pacing at the end of the Emperor of Thorns…); but all this palls with just how thrilling it all is; and I will admit that maybe the “flaws” may be ironed out on re-reading at a more sane rate. YES, as in Yes, you do need to read the Broken Empire trilogy before you head into Prince of Fools. There is just no other way around it. The Broken Empire trilogy creates the world and perspective that the reader needs in order to get the humor and understand some of the issues at play beyond the pages of Prince of Fools that have bearing on the plot. In Prince of Fools, Jalen finds himself ensnared in a spell and bound to a viking named Snorri. The two make their way North from the Red March (analogous to Southern Eastern France/Western Italy) into Scandinavian territories where they seek to break the spell and exact vengeance against the the Dead and dark forces that have cast them together. There is no lack of action or violence in “POF,” but it is not nearly as dark as in The Broken Empire trilogy. Because Jalen is not an aggressor or a risk taker, and in fact reactionary, his schemes are defensive in nature. The narrator threw away the line, like he had no idea of why it was written or why it would be important, so there was no irony in the interpretation. And this, yes, this was the deal breaker for me. Perhaps all my quibbling prior to this last peeve listed was a result of my not being able to recover from what I consider an egregious oversight, so he was damned nearly from the start. That being a given, I will still be willing to listen to Red Rising (by Pierce Brown, and upon the strength of which Reynolds earned the accolade of an AudioFile Magazine Best Voice of 2014; but I will be reading The Liar’s Key, the second book in the Red Queen’s War trilogy (to be released in June 2015) in print. EDIT: 01/16/2015 – Mark Lawrence is not Irish. Thanks too! Sorry that thorn bush lead to no end of grief … Enjoy #RedRising! 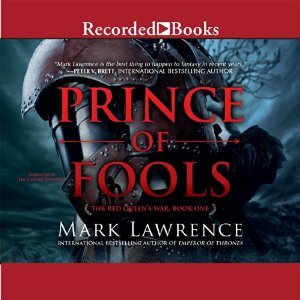 OTHER: I received a CD library edition of Prince of Fools: The Red Queen’s War, Book 1 (By Mark Lawrence; Narrated by Tim Gerard Reynolds) from Recorded Books in exchange for a review. I receive no monies, goods (beyond the audiobook) or services in exchange for reviewing the product and/or mentioning any of the persons or companies that are or may be implied in this post.